Piedra is a term used for infection of the hair shaft observed amongst animals as well as humans and caused by various fungi. The infection is caused by both black and white fungi. The black piedra is caused by the fungus Piedraia hortae. Symptoms include hard, black/brown nodules difficult to remove. It is commonly found in scalp hair rather than facial or body hair. The white piedra is caused by six different fungi. It is relatively a rare fungal infection of the hair shaft. The primary symptoms include gelatinous, pearly nodules surrounding the hair shaft, typically found in facial and body hair. In both types, the fungal organisms penetrate into the hair roots and cuticles and render the hair weak. As a result, hair tends to fall or break, causing considerable damage. Certain fungi also thrive on the body for prolonged periods and this weakens the immune system to a large extent. Individuals of all age groups and genders are equally prone to Piedra. It is different from dandruff as dandruff affect the scalp, while Piedra affects the hair shaft. Shaving or cutting off the hair in the affected region is a viable treatment option. Apart from this, oral medications and antifungal agents can be used. 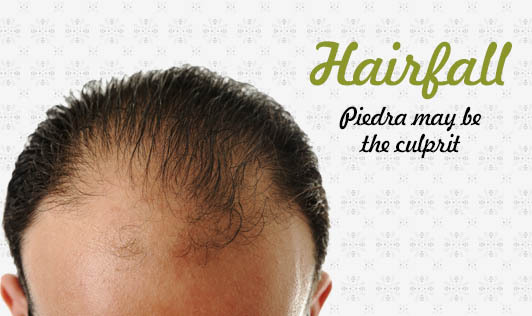 For black piedra, removal of hair is the best curative measure and recurrence is rare later. White piedra may require prolonged therapeutic treatment procedures as recurrence is common. If you suspect you have piedra, your dermatologist may help diagnose the condition and the type of Piedra you may have. Abide by the medication course and dosage, both of which are extremely important for permanent treatment.